I was met with a rude, abrupt attitude and treatment, as though I were, in fact, the defendant and guilty of some enormous breach of the law. The county employee said she would ask the judge to come and speak to me if I wished. I did, and so we sat and stood, the five of us, around a bench in the hallway for the next hour. Finally, this same person returned, minus a judge, but with an answer; no. The children were not to remain. I mentioned that my daughter was eighteen and therefore an adult and could accompany her three siblings as such. Maybe they could quietly observe one of the five trials taking place that day? I was then told, in loud tones and in front of a hallway full of people waiting to check in; “I’ll go tell the judge that you want to argue!” She stalked off without allowing me to answer. My daughter drove them home to wait for me. And I walked into the courtroom, where people were still entering to find a seat and where the informative film did not commence for another 20 minutes. I spent the next hour in agony. First over the safety of my family. We have a rule in our house; one kid does not drive more than one other kid at a time. There was my oldest, with three of her siblings and not a great sense of direction. Second,what sort of lessons had they taken away with them? Probably not the kind I originally had in mind this morning. 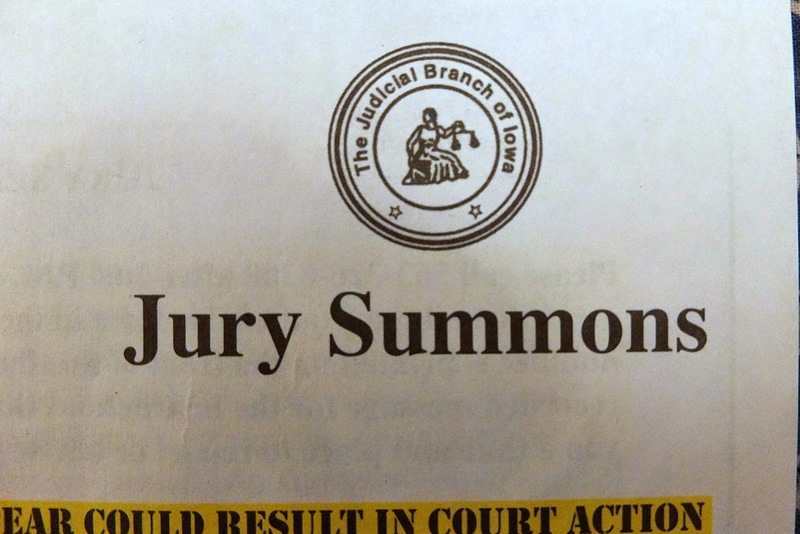 Third, I truly did not know, how I would reconcile conflicting civic duties; on one hand, jury duty, on the other, being the only person authorized to provide the required 148 days of instruction that needed to happen before the end of May. I wanted to find a way to do both, and that might mean a day or week of school break, home with their father, but what if it was a trial that went on for 3 or 4 weeks? In the end, the defendant did not appear for her trial, so our room's jurors were released. I returned home, to children who were still flabbergasted by the rudeness of one employee. There was nothing polite about the way my children saw their mother treated, in what they had learned was a place of justice, a concept which I hoped to further instill in them this day. Clearly, the court system is not meant to be day care. I was not expecting anything of the sort. I also understand perfectly that a judge could decide not to have a juror’s children in the same courtroom as the juror, once the trial was underway, in order to protect them all from the temptation of discussing the case at home. That is normal, as is the fear that they disturb proceedings somehow. However, we are speaking of school-age children,not toddlers, prepared for the experience of being in a courtroom, in a building where five trials were taking place that day, accompanied by an adult. I would like to know the following: is what happened today legal and normal? Are children simply not allowed in a courtroom? Are not the benches inside a courthouse public property? Could my children not have peered in for a second to see what a courtroom looked like? I had them study diagrams of where each party involve in different sorts of trials stood, but they could not visualize how imposing the judge's bench looks or the jury box from a diagram. A post-script for blog readers: I will post a reply, or the summary of one, if I ever receive such from the Courthouse. Stay tuned to find out the proper way to serve as a juror and homeschool at the same time. I am wondering if there is a clause that states that relatives of an attending juror cannot be in the audience. If that is so, it should have been explained clearly, rather than in the ham-handed way this was handled. Yes, I did search the entire Scott County Courthouse website before and after the incident. I found no mention of children not being allowed nor of family members of jurors being forbidden. We shall see what they have to say. It will either make it easier or more difficult for homeschool parents in the future.